Rich the Kid keeps Flexin. Delivering a treat for fans on Halloween, the Quality Control rapper unleashes a 12-track mixtape featuring Migos, Quavo, Desiigner, Famous Dex, and Jeremih. The Young Thug-assisted single “Ran It Up” appears on this effort, along with other previously-released tracks “Don’t Want Her” and “Dat Way.” Plus, it ends with the bonus track “Str8 Up” featuring Playboi Carti. As if that wasn’t enough, it looks like Rich has even more music on the way. Just a couple of weeks ago, he hit the lab with Lil Wayne. While waiting on the Rich/Weezy collaboration, stream Keep Flexin below. More than 20 years after Tupac Shakur’s death, the late rapper remains in high demand. 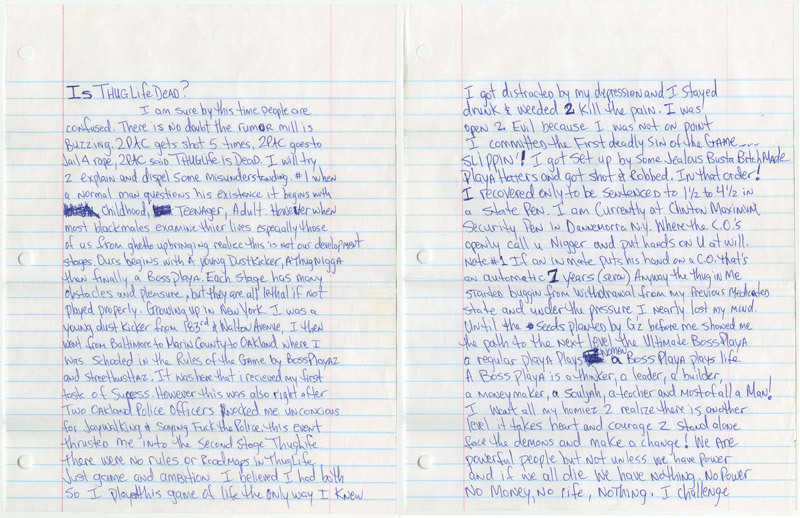 On Saturday (Oct. 29), a four-page letter handwritten by ‘Pac was auctioned off for an impressive $172,750. According to a statement from Goldin Auctions, the company responsible for the sale, the letter was part of a 10-lot Tupac Shakur collection including plaques and contracts, which sold for $206,625 as a whole. As reported earlier this month, the letter was written in 1995 to Nina Bhadreshwar, who worked at Death Row Records. Tupac died in a still-unsolved shooting around a month after writing the letter and the essay was never published. According to Goldin, this could be an auction record for any Tupac item. After weeks in hiding since her Paris robbery, Kim Kardashian was spotted in public and of course the cameras were rolling. Plus, Keshia Knight Pulliam took a paternity test, but her soon-to-be ex-husband won’t. The Insider’s Michael Yo gives us the inside scoop. After enlisting 21 Savage for a guest spot on “Sneakin,” Drake has given his new collaborator a Ferrari for his birthday. A week ago, Drizzy sent the 24-year-old a special happy born day Instagram message. “Happy G Day to a young October king with all the juice right now,” he wrote. Savage and Drizzy just happen to celebrate their birthdays two days apart. Savage was born Oct. 22, while October’s Very Own celebrates on the 24th. The 30-year-old OVO boss, however, is six years older. An artist paints his own reality. And somewhere in Malibu, Anderson .Paak and The Free Nationals illustrates one hell of a night of partying. Malibu in stores now. The Weeknd is taking Starboy on the road. The Canadian crooner has announced his “Starboy: Legend of the Fall” tour, set to run across the world for a large part of next year. Launching Feb. 17 in Stockholm, the 46-date tour will hit key markets across Europe and South America. The North American leg kicks off April 25 in Vancouver and comes to a close June 9 in Cincinnati. But wait, there’s more. “Surprise specials guests” will join The Weeknd on “Phase One” on his upcoming jaunt, with more dates to follow. It’s a new era for Abel, who chopped off his trademark locks going into this project. He also dies in the videos for both “Starboy” and “False Alarm,” marking what some describe as the end of the last Weeknd phase. Tickets go on sale Tuesday, Nov. 1, at 10 a.m. See the full “Starboy: Legend of the Fall” itinerary below. Hot 97’s Peter Rosenberg claims that Drake told him he didn’t write one of his earlier verses. Rosenberg didn’t recall the name of the actual track. Drake has never publicly admitted to using ghostwriters. However, he was sued by Rappin 4-Tay for lifting his verse off of “Playaz Club” for YG’s “Who Do You Love.” Drake ended up paying him $100,000 for his use of the lyrics. Reference tracks from Quentin Miller for several songs off his 2015 mixtape “If You’re Reading This It’s Too Late” were also leaked during his beef with Meek Mill. Go to the 37:25 mark. The manhunt for fugitive Michael Vance ended in a blaze of gunfire on Sunday night, October 30. According to a U.S. Marshals spokesperson, a gun battle was set off after Vance was pulled over near Leedey Oklahoma at around 9:30 p.m. [central time]. Vance would escape the encounter, having wounded a sheriff, but the chase that ensued came to an end more than 20 minutes later when he was cut down in an exchange of fire with three Oklahoma Highway Patrolmen. Authorities had reportedly begun closing in on Vance earlier in the day, but he was able to get away from the campsite they located him at just north of Hammond, 150 miles away from the town of Wellston, where his crime spree began last week. Vance came to the nation’s attention on October 23, when he took off in a patrol car after shooting two officers who were responding to a disturbance call. He too was struck in the exchange, and took to Facebook Live in his bloody tee, to document his get away. He was immediately declared “Wanted” and reported to be armed with an AK-47. “This is real s**t see? That’s a mother****ing gun. That’s the real deal. This ain’t a joke. This ain’t a prank,” he would record himself saying. Within hours Vance would shoot a woman and carjack her Lincoln Town Car. They would later find the car abandoned near a home, Northeast of Oklahoma City. Upon entering the premises, they found the bodies of Vance’s uncle and aunt, Robert and Valierie Kay Wilkson. Robert Wilkson had been shot, and both were stabbed multiple times, with police having concluded that Vance apparently attempted to dismember their corpses. Rico Recklezz on Baby Mother's Brother Attack, "He's Lucky He Wasn't Killed"
A$AP Mob returns. In honor of their late brother A$AP Yams, the New York collective has unleashed Cozy Tapes: Vol. 1 Friends- on Halloween. While the Mob is united for this effort, they don’t go it alone. Guests including Wiz Khalifa, Tyler, the Creator, Juicy J, Onyx, Lil Yachty, Lil Uzi Vert, Skepta, and more join the celebration. It’s the Mob’s first album since 2012’s Lords Never Worry and its first since Yams’ passing in 2015. Stream Cozy Tapes Vol. 1: Friends- below.